Sardar, Begum Ayesha (1927-1988) social worker, political activist. She was born in 1927 at village Khanpur in Bagharpara thana of Jessore district. Her father was Subrat Ali Sardar. She was a self-made woman and had her education through extreme circumstances, which she overcame and got her graduation. Begum Ayesha was active in politics and was the chairman of Muslim League Women Forum (1954), member of Zila Parishad and Divisional Council (1962), member of Basic Democracy (1965), and commissioner of Jessore Municipality. She was elected a member of the Provincial Assembly in 1965 under basic democracy system. 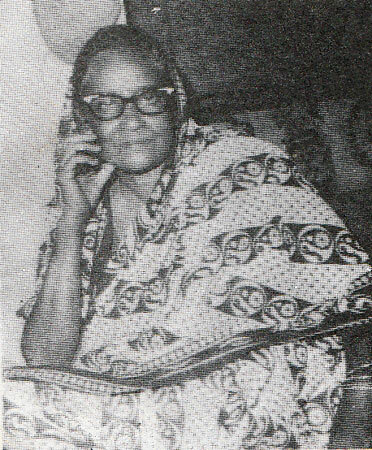 Begum Ayesha was the chairman of Khulna Zone Labour Federation (1967), commissioner of Dhaka Municipality (1977) and member of the central committee of Mahila Jagadal (1978). She was a member of the central committee of Bangladesh Nationalist Party, chairperson of Bangladesh Mahila Samaj Kalyan Samiti, commissioner of Dhaka Municipal Corporation and vice president of Jatiyatabadi Mahila Dal. In 1979 she was elected to the Jatiya Sangsad from a reserved seat for women. Begum Ayesha Sardar had been associated with various social welfare activities since her early life. She was a member of Jessore Shahitya Sangha (1940), secretary of Jessore Matri O Shishu Mangal Kendra (1948), president of APWA, secretary of Jessore Women Industrial Home (1952), Inspector of Jessore Central Jail and a member of the Jail Board. She played pioneering role in forming the Pakistan Nari Samaj Kalyan O Seba Sangha in 1955 and by her initiative Mahila Samaj Kalyan Samiti was formed each in Magura, Jhenidaha, Kushtia and Khulna. She floated the Jessore Journalist Association in 1958 and Shishu O Matri Mangal Kendra in the suburb of Jessore town in 1970. She established nearly fifty educational institutions in greater district of Jessore including Keshabpur Grils’ High School, S.S Girls’ High School, Jessore New Town Girls’ School and a number of madrasas and primary schools. She was a founder-member of Jessore Mahila College and a member of the managing committee of City College. Betweeen 1956 and 1971 she edited a Bangla monthly journal styled as Shatadal. She was the president of Jessore District Journalist Association (1958), president of Jessore Ebaquib Samiti (1963), secretary of Jessore Mahila Cooperative Society (1964), and director of Dhaka Cooperative Society. Begum Ayesha Sardar was honoured with the title of Tomgha-e-Khidmat by the President of Pakistan. She died on 16 February 1988.